Is Dredge America Right For You? Dredge America is a national marine contractor performing dredging services throughout the US and North America. We specialize in portable hydraulic dredging services to restore our nation’s lakes, rivers, and waterways. With 25+ years experience, Dredge America is committed to continually improving its’ expertise and delivering quality dredging and consulting services. During this time, we’ve engaged in numerous projects with varying scopes and budget levels. Dredge America will more than just “manage” your project. Our expertise allows us to save you time, money, and limit your risk exposure. As an experienced environmental dredging company, we use the latest technology and techniques to ensure surroundings and wildlife remain unharmed during the dredging process, as seen in the video above. 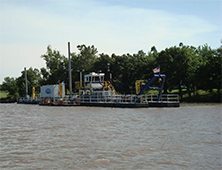 Dredge America is a national marine contractor specializing in portable hydraulic dredging services throughout the United States and North America. Projects outside the U.S. in the western hemisphere are considered on a case-by-case basis. Dredge America can revive your water features and reinvigorate business with deeper and clearer water. Hydraulic dredging is the perfect tool to pump sediment to the ideal grade for planting of wetland habitat. Dredge America can meet the standards for your environmentally sensitive dredging project. Dredge America has completed numerous projects at power plants involving CCR Removal and more. Click the link to view the Owner's Guide to Managing a Dredging Project. We provide design-build consulting services for project owners implementing a portable hydraulic dredging project. Click on the link to view the outline for the steps to start the dredge permit process. Once permits are in place, the search begins for a qualified, professional dredge contractor. Due to their professionalism, interest, safety, and politeness, I would not hesitate to put them on our bidders list for our next dredging project. The project was on schedule and under budget and I am very pleased with the results. I would definitely recommend Dredge America for any dredging project. They were very professional and great to work with. Dredge America performed to the terms of the contract, and went above and beyond what was expected to complete project on time. All of Westport’s needs were met in a professional and courteous manner. It has been a pleasure doing business with Dredge America and their entire crew, we would gladly hire them for future projects should the need arise. Dredge America quickly gained the confidence and respect of not only each Lakes and Dam Committee member but of our entire Board of Directors. *It should also be noted that each of the dredge equipment companies, after finding out that we had hired Dredge America, confirmed to us that Dredge America is, if not the best, one of the best dredging companies in the industry. The Dredge America team has been a terrific partner on this high profile project. A project aimed at saving a lake that provides water to six area cities, including Lawton, is nearing completion, ahead of schedule and under budget. The marsh restoration project is one of the largest and most complex ever undertaken on the East Coast and is a model for other coastal resilience efforts around the country. One of the most successful restoration projects in United States history. We provide access to new, used, and rental dredging equipment. Contact today for details.